Global Bio-implants Market is expected to garner $115.8 billion by 2020, registering a CAGR of 10.3% during the forecast period 2014 - 2020. Bio-implants have emerged as a promising solution for the variety of conditions such as cardiovascular, dental, orthopedic, ophthalmology, neurological disorders and others. High prevalence of disease conditions such as cardiovascular, orthopedic and spinal disorders that can be treated via bio implants are the key drivers of the market. According to American College Of Surgeons, 29% of the trauma injuries were caused by road accidents; the instances of road accidents and death due to the same are rising to about 2.2% globally. Such patients undergoing traumatic injuries can be effectively treated with the market. Such afore-mentioned factor and multifarious analogous factors across cardiovascular, spinal and ophthalmic disorders drive the growth of the market. 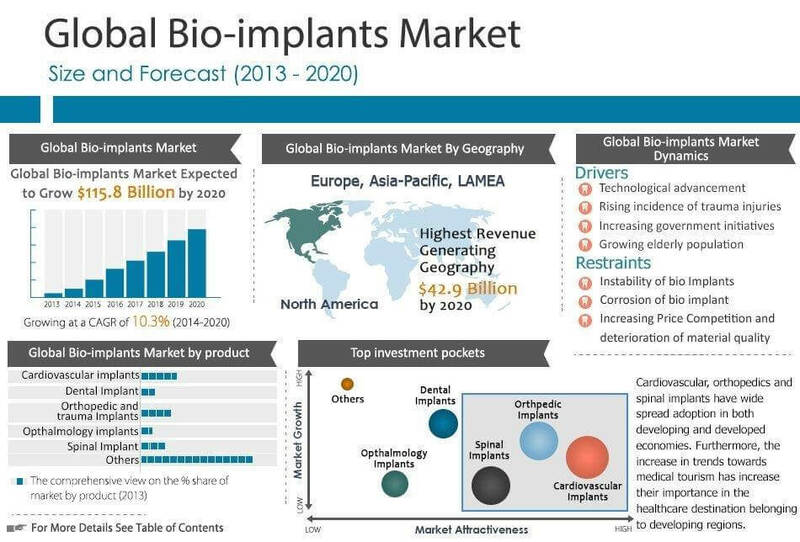 The global bio-implants market is segmented based on product types and geography. Within the product types, the market is segmented into cardiovascular, dental and prosthetic implants, orthopedic/joint reconstruction and replacement, spinal, ophthalmology and others. Geographically, the market is segmented into four regions, namely North America, Europe, Asia-Pacific and LAMEA. Key players operating in the bio-implants market focus on product launch, and continual R&D on variants of the market in order to retain competitive advantage. These players also adopt inorganic growth strategy to augment geographical diversification. Few of such companies mentioned in the report are Stryker Corporation, Dentsply international, Ethicon Inc., Wright Medical Group, DePuy Synthes, Biomet (Zimmer), Smith & Nephew, KLS martin and Medtronic. Bio implants are emerging as promising solutions for internal organ replacement therapies. Currently, cardiovascular and orthopedic bio implants have a lion’s share in the global industry and these are expected to maintain a steady pace throughout the forecast period. Moreover, other types of bio implants such as dental, spinal, ophthalmology are moving at a faster rate and these are expected to retain the double-digit growth rate throughout the forecast period. Rising number of trauma injuries are one of the most significant factors fueling the demand for bio implants and has a strong impact on the bio implants market. North America dominates the global bio implants' market. The Implanted medical devices' business, has emerged as the most profitable business within the U.S. healthcare industry. High prevalence of lifestyle diseases and growing numbers of aging population have shifted the trend towards the improvement of the quality of life for a patient through better treatment solutions that are not limited to hospitals and clinics. On the basis of these reports, it can be asserted that there exists a demand for smaller, implantable, reliable, and wireless medical products.